You are not just driving your car to get from A to B and long, winding roads make your heart leap? We are glad you found us. We will help you to unlock your engine’s maximum performance and make sure that you will never want to get out of your Audi again. Getting the figures: 2016 Audi RS3 with RaceChip performance upgrade. Audi created the permanent all-wheel drive Quattro, the first German diesel engine with direct injection and turbocharge introduced to the streets. It's also the world's first series saloon constructed with an aluminium integral body. RaceChip offers performance improvement for almost all Audi models: Whether saloon, coupé or convertible, the Avant, Allroad or Sportback, Roadster or SUV. You'll experience a whole new level of driving pleasure with RaceChip – that's what an Audi should feel like! Chip tuning from RaceChip offers you the latest form of electronic performance improvement. A highly sophisticated and individually programmed auxiliary control device is installed between the engine control unit and the sensors – a type of mini-computer with optimization software developed especially for your Audi engine. This software optimizes the electronic signals that control the engine, enabling up to 30% more power (HP) and up to 30% more torque (Nm). Our way of engine tuning works according to the same principle of electronic performance improvement that Audi itself uses to differentiate models with identical engine blocks. For example, today Audi offers a broad performance range from 150 HP to 190 HP with the same 2.0 TDI basis. RaceChip performance improvement always stays within your engine's thermal and mechanical power reserves. Your Audi's engine protection system remains completely intact. For 2.0 TDI engines in the current series (regardless whether in the Audi A3, A4, Q3 or Q5) you can surpass even the next-highest Audi model with RaceChip diesel tuning when it comes to power – and at a much lower price than you would have paid for the more powerful engine from Audi. The 3.0 TDI (like in the Audi A5, A6, A7 Sportback or A8) shows what it can really do after TDI tuning with RaceChip GTS – with irresistible drive and abundant power. For example, with RaceChip GTS the 218 HP version of the 3.0 TDI with 400 Nm torque can be boosted to 280 HP and an astounding 613 Nm torque. From wee to wow – the Audi A1 with the smallest 1.2 TFSI engine (89 HP, 160 Nm) easily bounds over the 100 HP mark with 102 HP (as well as 192 Nm torque) even with our entry-level chip, the RaceChip S.
A Q7 with 4.2 TDI and standard 340 HP comes to life with a RaceChip GTS to feature 393 HP. It shrugs off its heavy SUV side to reveal itself as an agile family vehicle that makes full-throttle acceleration fun. Plus, if you ever want to tow a trailer, then you'll enjoy the higher torque afforded by RaceChip – almost 950 Nm in total. You can even mobilize power reserves in the absolute top models like the RS6 with RaceChip. The GTS Black catapults these modern 4.0 TFSI turbocharged gasoline engines from 560 HP and 700 Nm to over 660 HP and 836 Nm. These values are at least on par with those achieved by prominent Audi tuners like ABT Sportsline. But you get all of this at a much better cost-benefit ratio with RaceChip. Read the article about our test drives with the new Audi RS6 here. Brand new: just introduced by Audi and already optimized at RaceChip – the new Audi TT, for both coupé or roadster. We offer our chip tuning products for almost all new TT engines. 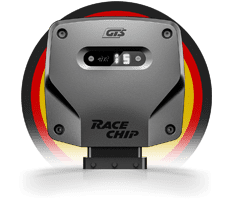 Further down this page you'll find an overview of all chip tuning products from RaceChip. Here you can simply select your Audi with the help of our vehicle selection tool and you will immediately see how much potential lies waiting in your Audi. With just a few clicks in our online shop you can configure the optimization package for your Audi and could even receive your specially-designed RaceChip in a few days. Order online now, install yourself in just 10-15 minutes and experience your Audi like never before.